Schwinn Treadmills – Reviews of the Current Line...Are They Worth It? Can a respected bicycle brand find success with Schwinn treadmills? That’s the bet the company took a few years back with its tentative steps into the very competitive home treadmill market. The parent company, Nautilus, Inc., has a number of popular brands including Schwinn Fitness®, Bowflex®, Universal®, and Nautilus®. Since Nautilus purchased Schwinn in 2001, the respected name in bicycles has been working to further establish its brand in cardio fitness products. The Schwinn bike, invented in 1895 by German immigrant Ignaz Schwinn, has been an American icon for over 100 years. By the 1960s, Schwinn Fitness had expanded to include home cardio equipment including the Airdyne stationary bike, which was a huge success. The company launched treadmills in 1994 when it came out with its first non-motorized treadmill, the Easy Tread. Unfortunately, the bike company did not aggressively jump on market trends, missing both the BMX and mountain bike crazes in the 1980s, and the brand suffered lagging sales and lost its lead in its bread and butter market. The Schwinn Bicycle Company declared bankruptcy in 1992. By 1997, Schwinn and GT Bicycles joined forces, but problems persisted and the corporation filed for bankruptcy in 2001. In 2004, the Schwinn GT Cycling Division was acquired by Pacific Cycle, a division of Dorel Industries, and the Schwinn Fitness Division was bought by Nautilus. The two organizations have shared control of the Schwinn brand ever since. In early 2010, Nautilus sold off licensing assets for Stairmaster® and Schwinn indoor cycling commercial products to Fit Dragon, Inc., but kept the other Schwinn home cardio products. As of our latest Schwinn treadmill review, there are only two models remaining in the series: the base 830 and the up-level 870. Both are priced around the $1000 mark, which means they do have a lot of competition in the marketplace. 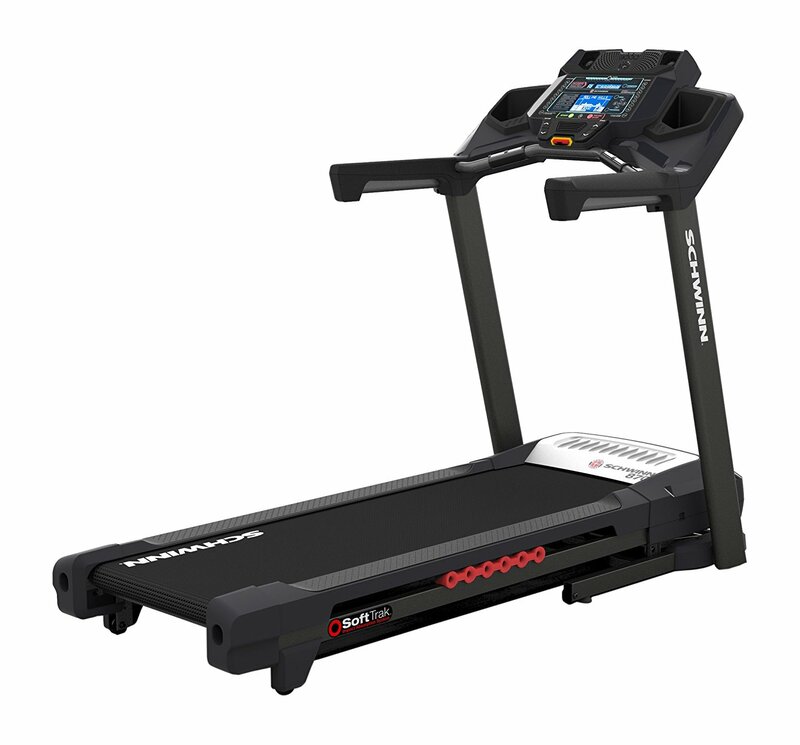 The base model in the series has a 2.75 CHP motor, up to 12% power incline, up to 12 mph speed, a basic blue backlit display, grip and wireless heart rate monitoring, easy SoftDrop folding, SoftTrack cushioning, a 1-ply, 20" W x 50" L deck, 22 built in workout programs and a 300 lb. max weight capacity. Some of the extras include a 3-speed fan, tablet holder, MP3 and speaker system, USB charging port and transport wheels. The more advanced 870 gives you a 3.0 CHP motor, up to 15% power incline, a more advanced display, free wireless heart rate strap, a 2-ply, 20" W x 60" L deck and 26 workout programs. In addition to all of the other features that the 830 gives you, the 870 adds more workout feedback, Bluetooth tracking via the Schwinn Trainer and Run Social apps as well as the Schwinn Fitness Score. So the 870 is really a big jump up from the base 830, giving you many more features and capabilities to work with. Which Schwinn Treadmill Should You Choose? This one is an easy one, as the prices are really not that much different to really factor into the equation. 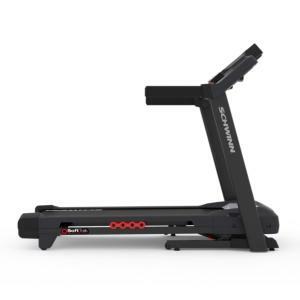 The Schwinn 830 is only about $100-$150 less than the Schwinn 870, so there is really no reason not to go for the more advanced treadmill, as it gives you so much more than the base model. As you've read above, you get more workouts, larger belt, better display, stronger motor, more incline and a free wireless chest strap. Is that worth another couple hundred bucks? Absolutely. A word of caution though. If you do end up buying a Schwinn treadmill, whether it's the 830 or the 870, make sure you opt for the extended warranty. You only get 10 years on the frame and motor, 2 years on electrical and mechanical, and 1 year labor. That type of coverage lags far behind competitors like Sole, NordicTrack and Horizon, which doesn't really inspire much confidence in the durability of these treadmills. Schwinn Fitness makes an above average line of budget elliptical trainers, but struggles to establish credibility with its treadmills. The treadmill lineup is down to two machines, and both are lagging 2 or 3 years behind those made by competitors. It is obvious the company has a ways to go before they can thrive and survive in the treadmill market. While you might find a reason to like Schwinn treadmills, you should do your homework and see what the competition offers. At present, there are at least a dozen other treadmill manufacturers that offer a better quality treadmill than Schwinn. 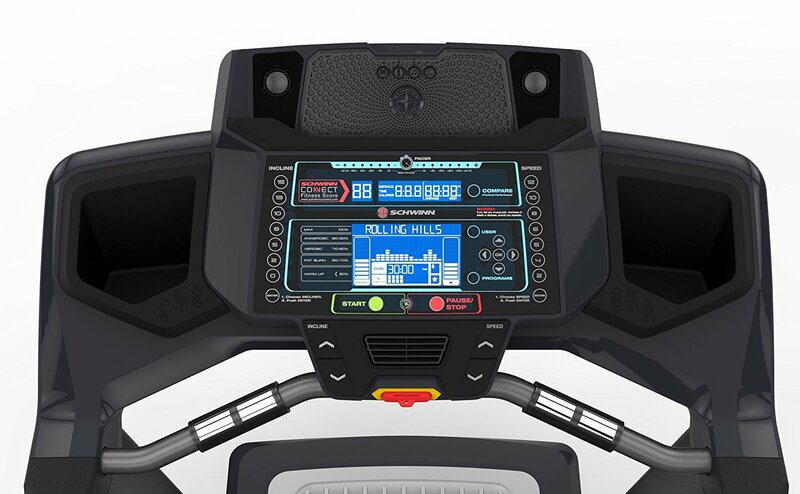 You can read more in-depth Schwinn treadmill reviews below, giving you more comprehensive information on the 830 and 870, with specs, current pricing, deals and industry news. Schwinn 830 Treadmill - Although an improvement on previous models, with a subpar warranty it just doesn't compare well with its competitors in the price category. Schwinn 870 Treadmill - A step up from the 830 with better cushioning, more incline, Bluetooth workout tracking, more advanced display and some additional improvements.